It's Big Energy Saving Week (27th - 31st Jan) so now is a good time to check on our fuel bills. See Nicola on video giving some energy saving tips on Shape Your Place. We found out all about recycling in Cambridge from Emma Cross, co-ordinator of the Recycling Champions scheme in Cambridge on Thursday 11th July. Read more here. CamBake and the Transition Cambridge Food Group had a great day at Eat Cambridge on 9th March! Lots of people came along to discuss how we can save for an uncertain future at the TC cafe night on 7th March - here's a list of some of the ideas we discussed. There'll be another chance to meet and discuss these issues on 28th March (details to follow). The new Transition newspaper has arrived! "Transition Free Press" is available on-line and as a paper edition, and you can get a copy at our events or e-mail us if you'd like to receive one by post. More info here. Stuck for ideas for low-carbon gifts? Have a look at our list of low-carbon gifts, produced by the TC food group a couple of years ago. And let us know if you have ideas of things to add to it! And here are some ideas for eco-friendly Valentine's gifts. 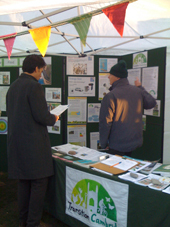 Here are some photos of our stall at Mill Road Winter Fair - thanks to everyone who helped out on the day! Transition Cambridge Vision for 2030 (draft) is waiting for you to read and comment. Do let us know what you think. Our annual report is now available, and is a great way of finding out what we are up to in Cambridge. Transition Cambridge at Strawberry Fair Here are some photos of our stall at Strawberry Fair, including workshops on making a solar panel from solar cells with Janis Freimanis from Grow Heathrow and stencilling designs onto T-shirts with Beejal Parekh. 4th birthday celebrations! Transition Cambridge is now four years old, and we celebrated on Saturday 19 May with a showing of the new film 'In Transition 2.0' and a wonderful party - here are some photos of the party. Thanks to everyone who joined the celebrations, and to everyone who helped - cake-makers, bread-bakers, tea-people, stall-holders, and those who washed up afterwards! For those who missed the film, we'll be showing it again soon - it's a really inspiring collection of Transition stories from all around the world. Follow us on Twitter! @TransitionCambs - we'll post reminders about our events, news items and things we find out about after the weekly bulletin has gone out. Here's a lovely article in Local Secrets by Robert Coe about our new community garden in Romsey Town, part of our Growing Spaces program! Over 200 people came to hear Rob Hopkins speak about "The Transition Journey" on 28 March, and we also celebrated Transition Cambridge's 3rd birthday! Here are some photos, the little video about Transition Cambridge, and Rob's write-up of the event on transitionculture.org. Thanks to everyone for making the night such a success!